I have made it my mission to find ways to get my high school students up and out of their seats (in a positive manner!) during class. I’ve recently created a new game, which combines elements of Pictionary and charades. I call it: The Word Wall Games! It’s available in my TpT store now! It can be played with individual vocabulary lists or teacher provided lists. A vocabulary review game for any subject! Teams earn points as they try to ACT IT OUT! DRAW IT OUT! OR MASHUP! There’s very little teacher preparation needed. Just have your students gather their vocabulary lists, make teams, and have fun! Oh – I need to put a Published by and bio at the end of my blog! I love this idea! 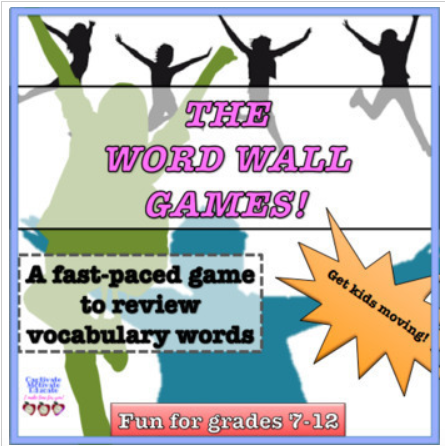 I am a huge Word Wall fan…for all grades and subjects! Thanks!! I think it’ll bring a lot of excitement and learning to the classroom!